A test run was carried out Monday in the newly built Hokuriku Shinkansen Line — an extension of the Nagano Shinkansen Line — that will begin operations in spring 2015, linking the cities of Nagano and Kanazawa, Ishikawa Prefecture. The test run came 40 years after the government opted to extend the bullet train network via the Nationwide Shinkansen Railways Construction and Improvement Act. Monday’s test run was carried out by a track inspection train. When the section goes into actual service, newly built E7 series shinkansen trains will ply the line. Ceremonies were held Monday at stations along the new section, with locals turning out to welcome the inspection train. 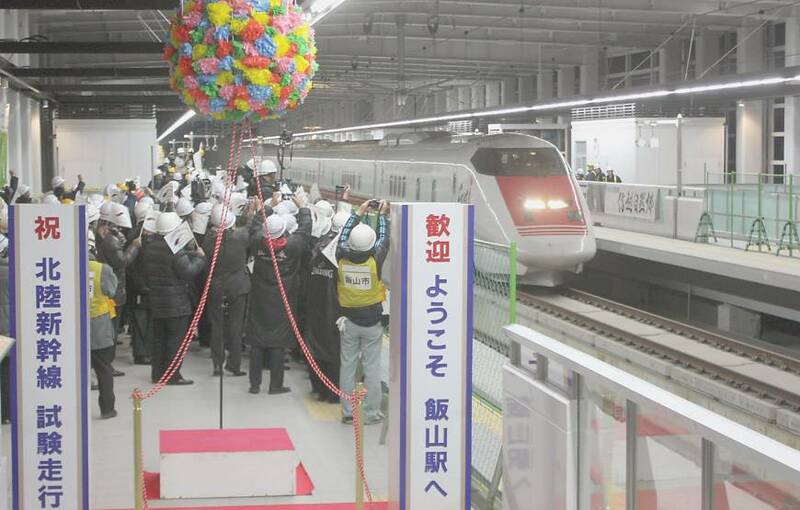 The test run was conducted by the main builders — the Japan Railway, Construction, Transport and Technology Agency — from the early hours of Monday through the afternoon. The task was to inspect about 135 km of new track linking Nagano Station with Kurobe-Unazukionsen Station in Kurobe, Toyama Prefecture. The new station is scheduled to open in 2014. 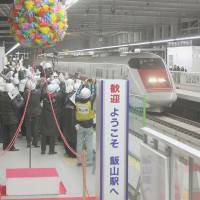 After a ribbon-cutting ceremony, an East i series track inspection train departed from Nagano Station at about 1:30 a.m. The train ran 30 kph to check for any irregularities in the rail and overhead catenary, as well as whether the train doors and platforms lined up properly. Tests will continue until March 28, mostly at night. E2 series trains now in use on the Nagano Shinkansen Line will be used during tests at various speeds, gradually increasing to 260 kph. Tests will also be carried out on the stability of rail vehicles in snowy conditions and on and the automatic train control system. Track tests on the 92-km section connecting Kurobe-Unazukionsen Station with Kanazawa will be carried out next summer. The section is still under construction. The E7 series trains that will be introduced when the extension is completed are undergoing inspections at East Japan Railway’s yard in Rifu, Miyagi Prefecture. In the near future, the new series will be also tested on the Tohoku Shinkansen Line, which connects Tokyo and Aomori, as well as the Nagano Shinkansen Line. About 200 rail fans were on hand when Monday’s test train arrived at Joetsu-Myoko Station, which is expected to become Niigata Prefecture’s gateway to western Japan. The number of those who attended a ceremony at the station to fete the new line reached 408, or four times the facility’s capacity.